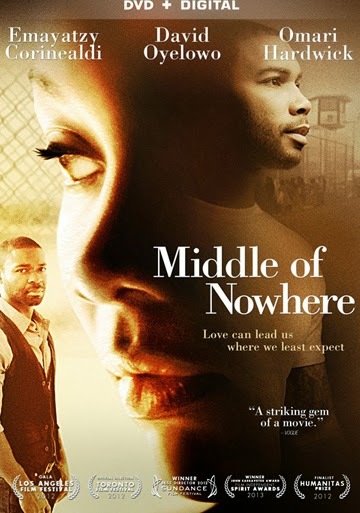 Experience a dynamic story of self-discovery when Middle of Nowhere arrives on DVD (plus Digital), Digital HD and On Demand January 13th from Lionsgate Home Entertainment and Code black Films. The “soul-stirring drama” (The New York Times) follows a bright medical student Ruby—played by 2012 Gotham Independent Film Award winner for Breakthrough Actor, Emayatzy Corinealdi (Addicted) — as she endures the hardships of loyalty and betrayal when her husband is imprisoned. Winner of the 2012 Sundance Film Festival Best Director Award for Ava DuVernay (upcoming Selma, I Will Follow), the “elegant, powerfully moving and courageous” (Salon) film also stars Omari Hardwick (For Colored Girls, TV’s “Power”) and David Oyelowo (upcoming Selma, The Help, Lee Daniels’ The Butler). The Middle of Nowhere DVD. Four years ago, Ruby was a vibrant medical student married to the love of her life, Derek. Now, Derek is in prison and Ruby is struggling to maintain hope. But a chance encounter with hard-working bus driver, Brian, and a stunning betrayal propel her in new and often frightening directions of self-discovery. Strong story, strong cast and very much an eye opener!